I’m rushing to get Gretel and I ready to leave on our 4-day backpacking trip. I’m not just getting ready for us but I am getting things ready for hubby to take care of Chester while we are gone. As always, I feel like there is too much to do and not enough time. One of the things I needed to do before I left was whip up a batch of Kong stuffing and fill them so hubby can quickly throw one in Chester’s crate when he leaves in the morning. A stuffed Kong is THE single most important thing that has helped with Chester and Gretel’s separation anxiety. In the past, I have put a bit (and I really mean A BIT – I’m lazy) of effort into making homemade “fancy” Kong stuffing. However, today I just needed something super quick and easy. I decided to use three ingredients I had around the house. The first thing I did was dig through our most recent Pooch Perks dog subscription box to see if I could use any of the treats they sent us as a base. All of the treats included in the Pooch Perks box are healthy and Made in the USA so I knew I wouldn’t have to waste precious minutes reading over the label to make sure they are safe. I found exactly what I was looking for inside – Peanut Butter Honey gourmet dog treats. I usually try to incorporate peanut butter into my homemade Kong stuffing somehow because it’s one of Chester and Gretel’s favorite flavors. The treats were the perfect consistency for my planned concoction too because they were soft and a bit crumbly. 3 tbs. Sweet potato and cranberry powder (Firm Up! Pumpkin + Cranberry) from Diggin Your Dog. Note: you can substitute canned pumpkin – make sure you don’t accidentally get the kind for pie. 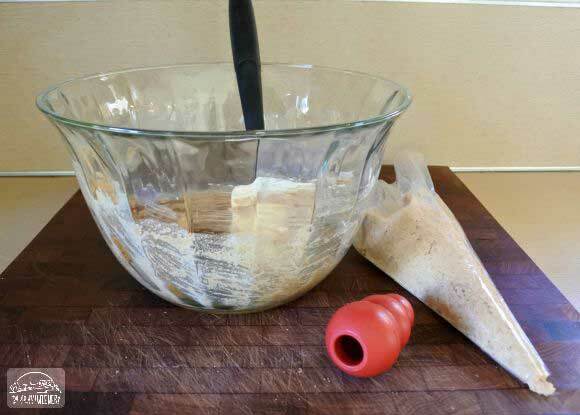 Put the dog treats into a food processor and grind them up into a kind of “meal” or grainy powder. Make sure the largest pieces are no bigger than a small pea. If the pieces are larger, pick them out and put them back in the food processor (or mash them up with a fork). Add the container of yogurt and mix until most of the “treat meal” is moist. Add approximately 1/4 cup of water and stir again. Note: If you use pumpkin puree instead of the powder, you may not need to add as much water… or any. I then scooped some of the stuffing into an icing bag because it makes it easy to fill the Kong. I use the smallest Kong so I cut off the end of the icing bag to make it just smaller than the hole. If you are using a larger Kong, the size of the hole is not important. Just make it small enough to minimize the stuffing leaking out on its own but big enough that the largest pieces of the “treat meal” can pass through. If you have stuffing left over you can put it into the icing bag, rubber band both ends so it doesn’t leak, and throw it in the freezer for next time. 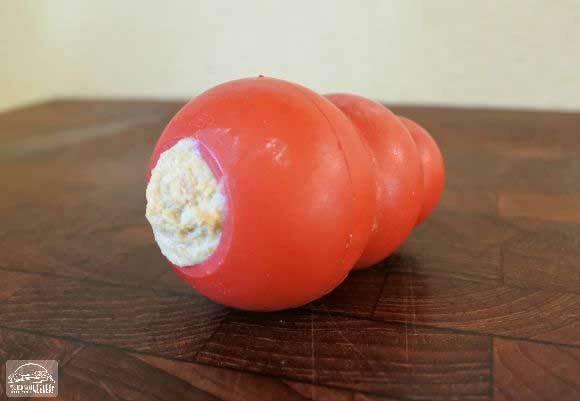 Throw the filled Kongs into the freezer until you are ready to use them and you are done. The whole process from beginning to end, including cleanup, took me 15 to 20 minutes. I have to add that something kind of neat happened while I was making this recipe. As I was dumping the dog treats into the food processor, this sweet little hand-written note fell out. 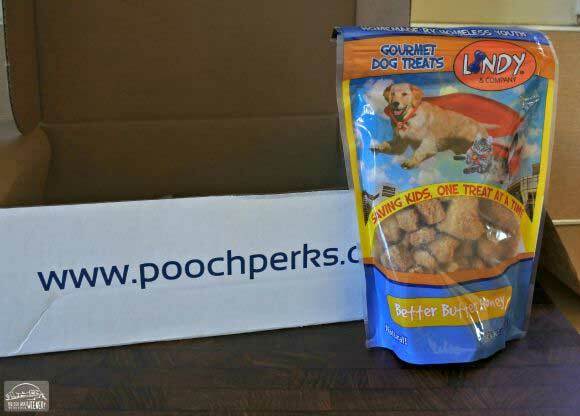 The dog treats I discovered in the Pooch Perks subscription box are made by Lindy & Company. 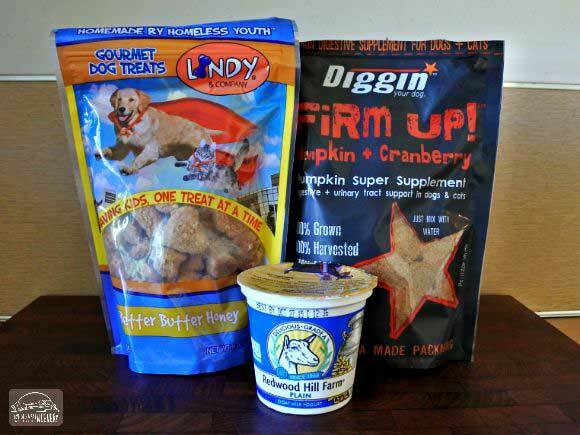 Their tagline is “Saving kids, one treat at a time.” Lindy & Company is a gourmet pet treat bakery where homeless youth learn valuable work skills so they never have to be homeless again. I was already felt “warm and fuzzy” about using the treats but that little note falling out of the bag was a special surprise. The thing about Pooch Perks is that they give preference to small batch gourmet, socially aware, treat companies like these when filling their subscription boxes full of goodies for you. I really like that because it goes beyond “Made in the USA” to “the making of these treats made a difference in someone’s life right here in the USA”. Add to that the fact that the treats are predominately natural, organic, non-GMO, and gluten-free and EVERYBODY WINS! Anyway, if you are interested in supporting a small business like Pooch Perks, you can sign up for a subscription here. Disclosure: This post is sponsored by Pooch Perks. I received compensation in exchange for sharing my Pooch Perks experience with you. Here at YouDidWhatWithYourweiner, I only write about products that we would use and everything I say is really how I feel. Pooch Perks is not responsible for the content of this article. Good article … I need to “step up” when it comes to filling Sparkles kong obviously. Can’t wait to see her reaction when I give her something a little more special than the norm! Thanks! This is awesome. I might try it! I often put plain yogurt in the kongs and freeze them. That is nice in summer. I used to put just one ingredient at a time in the Kongs but I like the idea of “surprise tasty morsels” so I try to mix a few things together for the stuffing. Gretel used to have SO MUCH separation anxiety. She totally busted up a plastic kennel once and broke two mails on a metal one and bled everywhere. Giving her the Kong when we leave totally solved the problem! It may not work for every dog but I highly suggest trying that method. I hope it works out for Beau. We’ve been getting a lot of fruit and yogurt mix Kongs with a few tiny treats tossed in. Your recipe sounds pretty good, though! I’m really lazy when it comes to Kong stuffing too and I’ll just put ground beef or raw food or canned food in it. Someone declines to eat vegetables. I’ve heard of some people putting their dog’s whole meal in a Kong to slow them down. Chester and Gretel wouldn’t stand for that – that food must be in a dish or it’s not a meal 🙂 Frozen Kongs are definitely great when the weather is warm. I’ll have to try this recipe! I’ve heard some good things about Lindy & Company. We need to share this with Grandma Faye because her dog Bandit loves to eat peanut butter from his Kong. 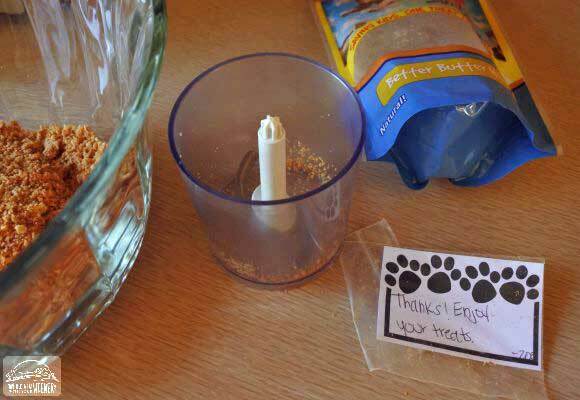 totally pawesome recipe- we’re going to try dis over da weekend! I absolutely LOVE Kong toys that can be stuffed w/ all kinds of goodies – they have saved me & my dogs many times! A stuffed Kong always gets them to focus. I don’t usually use yogurt, but I know they really like it so I’m going to add that ingredient. I normally put pieces of their favorite treats in the bottom of the kong, then on top of that I add peanut butter mixed w/ something like sweet potato, pumpkin, or mashed banana. Stuffed Kongs are a serious crowd pleaser in our house! Goat yogurt is easier to digest than cow if that matters to you. I only know that because I had a milk allergy when I was a kid so my Mom had to give me goats milk and yogurt. Taste-wise, I think dogs like any yogurt though. Quick and simple! I like it! I had to use a Kong for Cairo’s separation anxiety as well! Now I stuff them for all 4 to keep them busy while I’m working during the day. Thanks for sharing! I should totally try this! 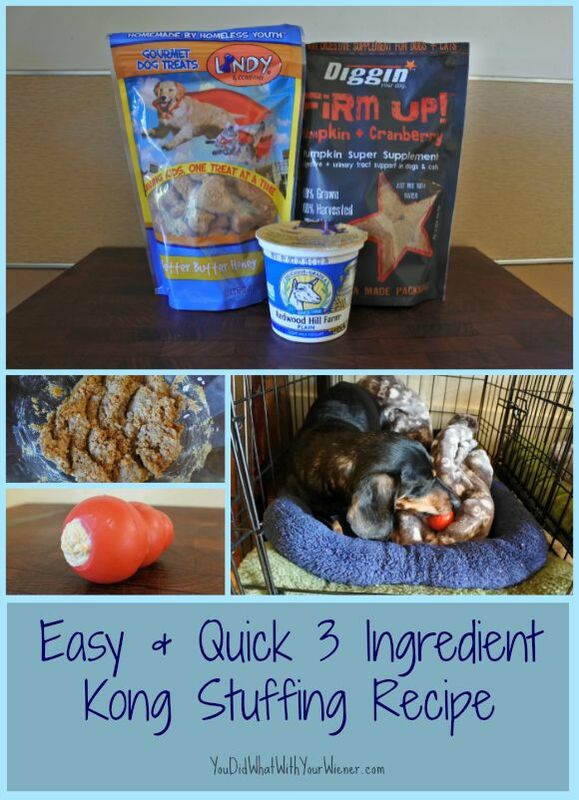 I give Rooney a Kong every day and I think he would appreciate a creative recipe! So the Kong’s don’t show any wear from being frozen and re-frozen? I’d love to get a set and leave them in the freezer for the work week!! No, KONGs, and other toys made of similar rubber, are really tough. I’ve had a couple of the toys for years. As with any chew toy though, your experience may vary depending on how tough of a chewer your dog is though. Dachshunds can be voracious chewers but Chester and Gretel spend more time trying to lick the stuff out of the treat toy rather than chomping on it (although Gretel does have a system for getting the stuff out that involves chewing).